A new year has brought a renewed passion among Nebraskans to work together to create positive change and engage elected officials on issues important to our communities. 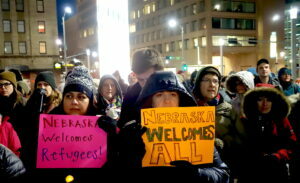 300 Nebraskans attended “Light The Future” vigil in support of immigrants and refugees on January 12 in Lincoln. 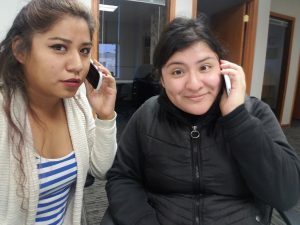 To respond to this spirit of advocacy, nearly 20 Nebraska community organizations announced today the launch of “100 Days of Justice” a collective effort to help Nebraskans who are excited to be a voice on important local, state, and national policies connect with one another and make their voices heard by policymakers. Nearly 80 Nebraskans delivered letters to Sen. Deb Fischer’s office in Omaha urging her to protect quality health coverage on January 24. 100 Days of Justice seeks to capitalize on the influential time that comes at the beginning of a new Nebraska Legislative session as well as a new Congress and Presidential administration. As newly elected officials take office, and returning officials head back to their public service duties, now is a pivotal time for their constituents to set the priorities that will let us all move into a better future together. During “100 Days Of Justice,” we will connect Nebraskans with their elected leaders to let them know their decisions must reflect our shared values of Justice, Racial Equity, Humanity, Opportunity, and Healthy Communities. Nebraskans will let our leaders know that our state is a stronger, better place when everyone has a real chance to succeed. 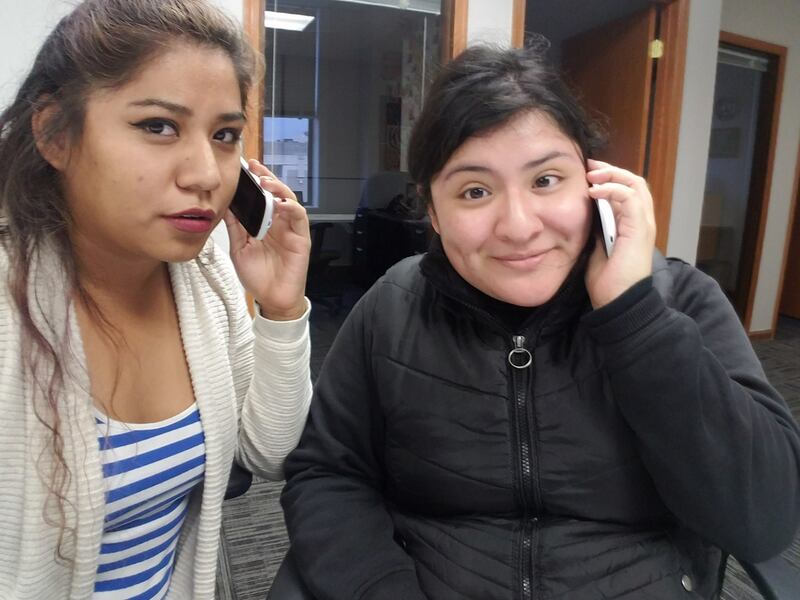 Nebraskans across the state can make phone calls to elected officials about important issues. 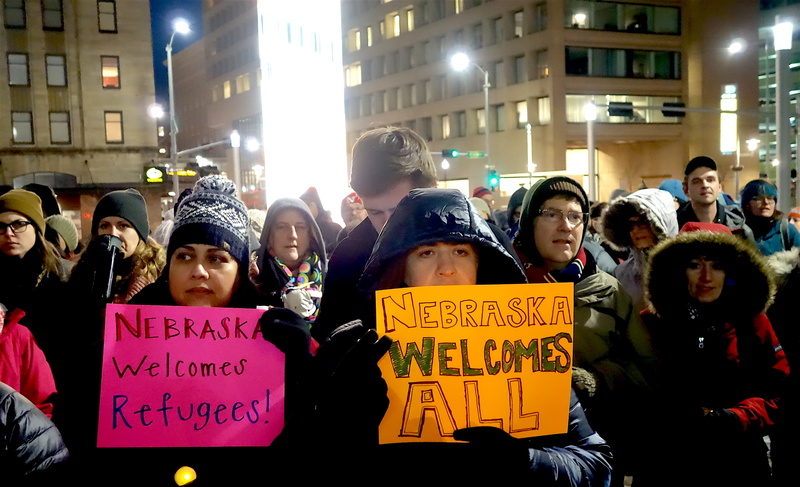 Hundreds of Nebraskans attended January 12 vigils to support immigrants and refugees in Lincoln and Omaha. “Writers Resist” workshops in Lincoln and Omaha to promote civil rights. The 22nd Annual Rev. Dr. Martin Luther King, Jr., Youth Rally and March on Jan. 21 in Lincoln. Women’s marches in Omaha, Lincoln, and Loup City held in conjunction with the historic women’s marches across the country on Jan. 21. 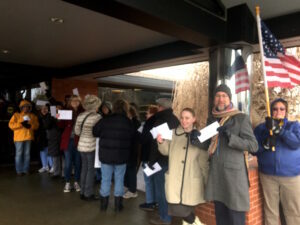 Nearly 150 Nebraskans delivered personal letters to Sen. Deb Fischer and Sen. Ben Sasse’s offices on Jan. 24 urging them to support access to quality health care. Holding turnout events around an important issue. Holding small gatherings at your home to make calls or write emails to lawmakers. Sharing personal stories with friends or co-workers about how an issue affects you. Volunteering for a local organization that shares your interest. Individual Nebraskans or organizations who want to learn more about how to participate in “100 Days of Justice” should contact one of the participating organizations listed above. Everyone has a role to play in building a better Nebraska where everyone can live “The Good Life,” and everyone’s voice is important. it seems we are entering into some form of police state!! !- I thank my lucky heavens for appleseed you fill my heart with hope. Thank you to every single one of you.